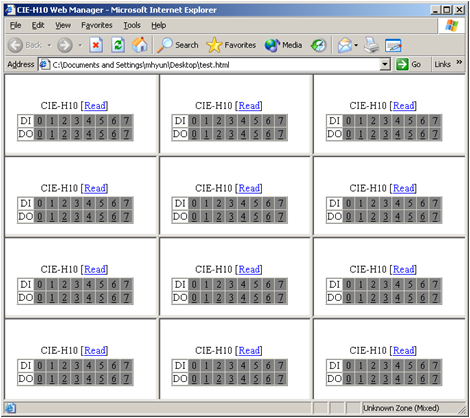 CIE-H10 supports HTTP protocol for monitoring & controlling remotely. H10 should have a homepage then, it operates like a web server. In this way, it is hard to monitor and control multiple devices, because running multiple web browsers is needed. However, it is possible to control many H10s if you use a web server. This uses simple HTML codes to display two or more H10s web page. A simple example is followed. CIE-H10/M10 supports the Uploading Users's Homepage function, so you can modify the details of homepage.